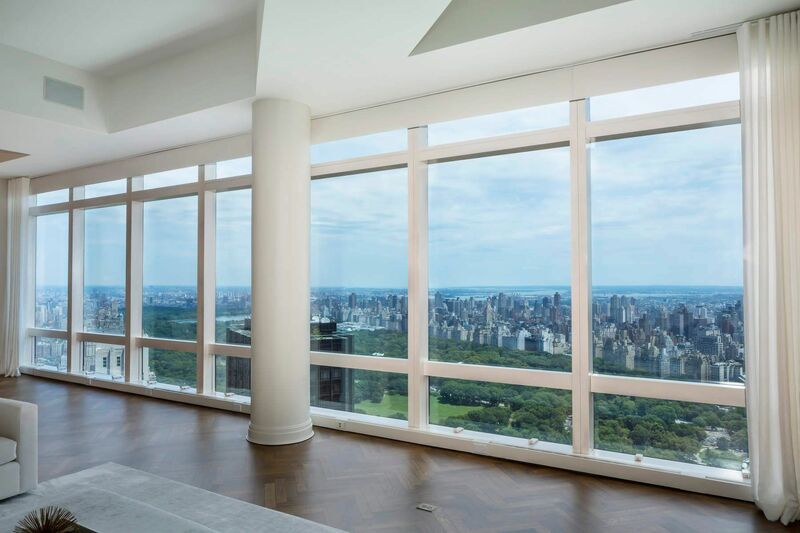 This Penthouse offers 70-linear-feet on Central Park as well unparalleled jet liner views of the entire city including the George Washington Bridge, panoramic views of Central Park, the East River, the Chrysler building, Empire State Building, Wall Street, the Statue of Liberty and due west over the Hudson. This spectacular residence boasts grand living space with soaring high ceilings. A 40-foot great room has an adjacent 30-foot master bedroom suite facing the Park. Additionally, the apartment features four large bedrooms, master marble bath, total(6 1/2 marble baths), a gorgeous wood paneled library, and a huge media room/family room with panoramic river views. There are two kitchens. The enormous main eat-in kitchen is finished with verbena wood cabinets, marble floors, and stainless steel top of the line appliances. There is another smaller kitchen off the media room. The entire apartment is run by a state of the art Crestron System which controls all motorized window treatments, a full in-house stereo system complete with speakers in every room, and a touch screen audio-visual system which controls all televisions and iPhone/iPad docks. There is no other apartment like this in New York City. This 5-star condominium offers amenities on the 51st at Club51 including a private screening room, state-of-the-art gym, private party space, children’s playroom, private massage room and outdoor terrace. A parking garage is available.